The Algorithmics group focuses on Algorithm Design and Algorithm Engineering for combinatorial optimization problems. Algorithm Design deals with the development of algorithms and their theoretical analysis. Since many problems are not known to admit fast exact algorithms, one may turn to faster approximation algorithms or, when the input is restricted in a certain way, to fixed-parameter algorithms. Algorithm Engineering focuses on the implementation, experimental evaluation and optimization of algorithms for problems that often have practical impact in interdisciplinary projects. 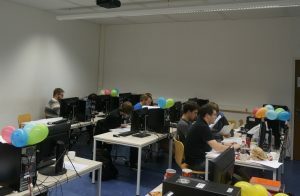 Within the scope of the "Approaching Programming Contests" practical, five student teams from Johannes Gutenberg University participated in the German Collegiate Programming Contest (GCPC 2016). Team JOGUrt (picture, right) earned an excellent 14th place (of 96). Some students consider competing in the Northwestern European Programming Contest (NWERC 2016) as well, which will be held November 19th-20th in Bath, UK. Please mind: the course names are available in German only.